Ladies and gentlemen, I'll call the meeting to order. We do have quorum, so we'll commence now. This is the eighth meeting of the Standing Committee on Government Operations and Estimates. We have with us once again the Honourable Scott Brison. Thank you very much. My first question, Mr. Brison, is do we have you for an hour? Thank you very much. I appreciate your being here and I appreciate all committee members making room in their schedules as well. Without further ado, Minister Brison, we'll turn it over to you for an opening statement. I want to thank you, Mr. Chair, and all committee members for being flexible about the meeting time. I know there had been a change. Parliamentarians are very busy, and I really appreciate committee members helping accommodate us today. We were told you were bringing pizza. Pizza, well, okay, but it may break Treasury Board guidelines if I tried to bring it in. I'm delighted to be here today to talk about the 2016-17 main estimates. I'm pleased to be here with my colleagues in my department: Yaprak Baltacioglu, the secretary of the Treasury Board; Brian Pagan, the assistant secretary of the expenditure management sector; and Renée LaFontaine, the assistant secretary, corporate services, and chief financial officer. After my remarks, we'd be happy to receive your questions. As you know, on February 23, the Government of Canada tabled its 2016-17 main estimates. These main estimates provide information to support the government's request to Parliament to approve $250.1 billion in spending to deliver programs and services in the fiscal year starting April 1, 2016. This amount includes funding for significant initiatives noted in each separate organization's main estimates. These main estimates reflect spending proposals that are already planned and they represent "up-to" amounts. I'd like to discuss an important issue with you now, the misalignment of the budget and estimates processes. We had this discussion last time briefly, but looking at the main estimates you can really see a disconnect between the main estimates and the main budget, and I'm going to point out an example of that. You may ask, for instance, how can it be that a department like Indigenous and Northern Affairs is having its funding both decreased and increased? You may draw that conclusion considering that budget 2016 announced very significant investments in first nations, Inuit peoples, and the Métis Nation, totalling $8.4 billion over the next five years. Yet, these main estimates that we're discussing today actually show a decrease in Indigenous and Northern Affairs Canada's budget by over half a billion dollars. That relates to the fact that we now expect to need less in 2016-17 than the government had previously forecast for claims agreements, including land claims and resettlements related to residential schools. This is a perfect example of why we need to look at the realignment of the main estimates and the budget. With the main estimates currently introduced before the federal budget each year, there is no opportunity for the main estimates to reflect the priorities that the government lays out in its budget. This confusion created by the lack of alignment between the main estimates and the budget, and the resulting effect on transparency are an indication of why we ought to work together to fix this. These are the main reports to Parliament on the government's finances, so if we want to make this complex process of planning, spending, and tracking tax dollars less complex and more timely and transparent, we can make a real difference—this committee particularly, working with Treasury Board and the Department of Finance. This is why we've started discussions with parliamentarians and other stakeholders on reforms to improve the process and to give parliamentarians better and more timely tools to hold government accountable. Australia is one jurisdiction where the main estimates are presented after the budget. This practice allows for significant budget measures to be included in the main estimates, which helps speed up delivery on government's priorities and also provides a more coherent flow of information to Parliament. The budget sets an overall fiscal plan, and then in this context, the government asks for Parliament's approval for the appropriations. The spending plan set out in the estimates is more easily reconciled with the budget's forecast for expenses. Closer to home, Ontario has a similar process and gets top marks from the C.D. Howe Institute for the clarity of presentation in their financial documents, from budget forecasts to appropriations to year-end results. I think we can look at models such as these, and learn and improve our own systems. Returning to the 2016-17 main estimates for our department, the Treasury Board Secretariat, we're seeking Parliament's authority for $6.6 billion in funds, which represents a decrease of $321.6 million from last year. Of this $6.6 billion, only $209.5 million would actually go to Treasury Board to support the operations of our department. The remaining $6.36 billion would support central votes for the rest of the government, for which Treasury Board is responsible. This includes things such as the public service insurance, government contingencies, and requirements for public service pay in areas such as parental or maternity leave, or severance pay. These funds are managed centrally by Treasury Board and are transferred to departments and agencies throughout the fiscal year as required. If you need more information about Treasury Board's plans for 2016-17, please refer to our report on plans and priorities, which we tabled in the House on March 7. I know you all wait with bated breath for me to table my report on plans and priorities. I brought a free copy with me for your reading enjoyment today. I would add that an interim supply bill seeking Parliament's approval to spend funds in line with these main estimates was also introduced on March 21. The interim supply sought approval for monies that would cover planned government expenditures for the first three months of the fiscal year. With respect to new expenditures announced in the recent budget, according to the current parliamentary supply process, we will begin to present the details of those in supplementary estimates (A), which will be tabled next month. In the time remaining, I'd like to bring you up to date on what we're doing to improve the oversight of government spending. These main estimates include a pilot project with a vote structure for Transport Canada. In the last main estimates, this department had three votes based on the kinds of things the funding is for: operating expenditures, capital expenditures, and grants and contributions. In these main estimates, we've expanded the grants and contributions part into three program-based or purpose-driven votes. Parliament now has a clearer indication of both what the funds are buying and which departmental programs are supported by these funds. This pilot gives parliamentarians and Canadians more detailed information in a more useable format. The ability to exercise oversight is considered to be the most important role parliamentarians can play on behalf of citizens. To do it properly, parliamentarians need access to accurate, timely, and understandable information about government spending. I'm committed to working with parliamentarians to find ways to make improvements. We've already taken some concrete steps. In December, for example, I came before the House of Commons in committee of the whole to present the supplementary estimates (B). I appeared with Minister McCallum. This, of course, included important new spending to support Syrian refugees. Our government had a choice then. We could have used the less transparent Governor General warrant process, but we chose to give parliamentarians a chance to debate and question this spending. Moreover, there's an annex to the supplementary estimates that provides Parliament with an early indication of the lapses expected for this fiscal year. In terms of accountability, projecting lapses is a significant step forward, and it was recognized by the parliamentary budget officer, who said that it “represents an important increase in fiscal transparency”. As we move forward, we intend on taking further steps to provide more useful information, in a more useful format, to parliamentarians. Mr. Chair, I would like to return to the committee at the earliest opportunity to discuss these steps in detail. We all have a vested interest in improving accountability to Parliament, and I look forward to working with this committee as a partner in progress as we move forward. Thank you very much, Minister. I might say, just as an extemporaneous comment, that it's really a pleasure to see you volunteer your time to come back to committee. In many cases, getting a minister to a committee is not quite as easy as having one who is volunteering. Thank you for your co-operation. We'll start with the seven-minute rounds and Madam Ratansi. Minister, I was happy to hear that you would like to match the estimates and the budget process, that this alignment would bring about transparency, and that you're looking at the Australian model. I have a question for you. I look at the total budgetary expenditure of $250 billion, of which over half is in transfer payments. As we look at the transfer payments that take place, I'd like to understand what your sense is of the governance structure, especially in health care, or where you transfer payments for the elderly to provinces. What sorts of checks and balances do we have in the system when people come to us and say that they need this much money for health care, and we say that the money was transferred to the provinces? What sort of governance structure are you envisaging as you move along to make it more transparent and accountable? Thank you, Ms. Ratansi. You raise an important question. The reality is that a very significant part of our budget as a government is transfers to other levels of government. We do have a constitutional reality around things like health investment and education investment in Canada, and we are a full partner in working with provincial governments. We do believe as a government that working in partnership with provinces on health care, as an example—and my colleague Minister Philpott is working with her colleague ministers provincially—we can actually achieve much better results in health care. Also, we can address some of the big issues facing the country, such as issues around our aging demographic, health care issues around home care, and issues around quality of life towards the end of a person's life, and things like palliative care. There are some provinces that are doing a much better job than others. We can work with some of those provincial governments to identify best practices to share with other provinces. But in terms of accountability of provincial governments, you can only garner accountability when you're at the table and are having meaningful discussions and dialogue. As a government, we're doing that on a number of important files, health care being one of them. My second question is in regard to your mandate on sexual harassment, in that you want to make the workplace free of sexual harassment. When the public service employees were asked, 20% of them stated that they were facing some form of harassment. Could you, as the Treasury Board minister, tell us what are some of the actions being taken by your department? It does affect your estimates. What actions are being taken by your department to ensure that this does not happen and that we have alleviated the problem? Thank you, Ms. Ratansi. This is an extremely important issue. We are working with the public service unions on this as well. This is something that we view as a joint effort, where there's a lot of common ground, and it's something that we intend on deepening in our work with PSAC and other unions representing the public service. The numbers are troubling. I think there's been progress, but we have a long way to go. We're committing resources, but also, the partnership with the public service unions is going to be very important. Incidentally, in regard to our colleague Michelle Rempel's piece that I read on this issue this week, for her to speak out as she has, as a member of Parliament and as somebody who's been a minister, reminds you of issues that continue to exist in this place and Parliament. Demonstrating leadership here is important more broadly within the public service. In terms of some of the specifics we are working on now, I mentioned some work with the public sector unions, but Yaprak, our secretary of the Treasury Board, may have something to add to this as well. Thank you very much for the question. It is a very important issue, and we are acutely aware of the numbers in the public service. For us, even 1% is far too many. For the Clerk of the Privy Council, a healthy workplace has been made a government-wide priority, and this is reflected in the deputy minister's performance accords with the clerk. Of course, a healthy workplace comes with working in a respectful workplace, and that should be free of harassment. With regard to the Treasury Board Secretariat and our minister's role, we are the holders of the management policy, which means that we make the rules as to what is acceptable and what isn't. It doesn't matter how many rules you put in place; you have to make sure that the culture is one of respect. It is an ongoing effort and ongoing education. As well, this year we are going to try to see if there is a way to do annual checkups on those kinds of important issues, so that it's not a case of your getting a number every three years and then you can't really hold anybody accountable, or you don't know where your problem areas are. We are looking at that as a way to have more of a real-time checkup on how the employees are feeling. As you do appreciate, for us all—and for me, as a woman and a senior public servant—it is a critical issue, and we have to lead by example. Nobody should suffer in silence, so you have to do something about it. You have to speak out. My counter-question is, is there money allocated to it? For example, if you look at the budget, it talks about gender-based analysis, so you are looking at everything through a lens of gender, which is helpful when you are allocating money to anything and you have to ensure that it benefits both the men and the women. Is there anything like this that is a transparent lens, so somebody can say, these departments have taken the initiative to proactively go and ensure that their workplace is free from harassment? On gender-based analysis, if I may, Yasmin, one thing that makes a huge difference is ensuring that women are at the decision-making table. It means, for instance, having a gender-balanced cabinet. I can tell you that this is the second time I have had the opportunity to serve in a cabinet, and in both cases the argument made for having more women at the table was often that it is good for women. In fact, I don't think that is the best argument. The argument I make is that you actually create better decisions, because when you have diversity at the table, you bring people with different perspectives. When we discuss policy issues at our cabinet table, gender-based analysis is inherently part of what we do on an ongoing basis. Within government, we are seeking to structuralize that. Now we will turn to Mr. McCauley for seven minutes. Minister, I have a quick question on the interest. It is nice to see that the forecasted interest is coming down 11%, I think it was. You are saying that a large part of it is “the downward revision of forecasted interest rates by private sector economists”. I understand that this is in comparison to what we had forecasted previously. Was that also based solely on private sector economists, or was it government sector economists, or was it blended as in apples to apples? Yes, the composition of expenditures is showing...11.1% less than the 2015-16 estimates. They are saying that it is because of lower forecasted interest rates, compared to previous forecasts. Is it based on private sector forecasts? Was it private sector forecasts for the 2015-16 estimates? I am sorry. I just want to be very clear about the question. Are you speaking about interest payments against the federal debt, or are you speaking about interest payments on a particular government program? It's on the 2016-17 main estimates, $2.84 billion. “The amount to service the public debt anticipated” in 2016–17 is $2.84 billion, or 11% less than last year, based on private forecasts. That is what I am asking. Is it apples to apples? It is apples to apples. They have been doing it this way for many years now. I'm going to jump around. I'm sorry. There's a part on expenditures by strategic outcome and program for Canadian transportation accident investigation. The estimate next year is $29.8 million. Is this forecasting what you expect to spend on investigations, or is this proactive work being done? Is this for the transportation investigation board? Our structure for strategic outcomes allows departments to disaggregate their votes by purpose. In this case, that forecast is the estimate of the current forecast of their authorities for this year for that purpose. The estimates are structured in a way that would allow comparison year over the year, so you can see what they are doing for that purpose or that program. That's $275,000 approximately for pipeline occurrence investigation. Is that very minimal? I'd need the specific page reference to be able to give you a comparison. Page 78 of the document. On pages 78-79, we're seeing the Canadian Transportation Accident Investigation and Safety Board. Their total voted program is $26.2 million. They break that down by their strategic outcome. You were talking about aviation? No, the pipeline from Alberta. That's all we care about. This particular board does estimate how much it's going to cost them to do a particular investigation, and that's what they report to Parliament. If the organization feels that's as much money as they need, then that would be it. I don't think we want to give them more money if they can't use it. Okay, that's what I'm asking. Sorry about jumping around. That's a small amount, so to speak. The $3 million for the Governor General is an increase requested to better choose people to better represent Canadians. Is it not better just to direct these folks on diversity rather than adding, and seeking out additional...? What I'm trying to say is, if it's for the Order of Canada, etc, do we need to spend $3 million to add a program to figure out how to be more diverse in choosing people? That's how it falls under the Governor General's office. In terms of the specific wording, “to support and modernize the Canadian Honours System and bring it closer to all Canadians”, that is a priority of the Governor General's. This amount represents an increase to meet that priority. Do you have a quarrel with the idea of bringing things like the Order of Canada closer to Canadians? No quarrel at all. In fact I'm very much for that, because if you look at it, it's Ontario-centric and not western-centric. It does not reflect Canadians. If I may interject for a moment. This committee does, if it wishes, have the opportunity to invite representatives from not only the Governor General's office, but also the AG's office, to talk about their budget. 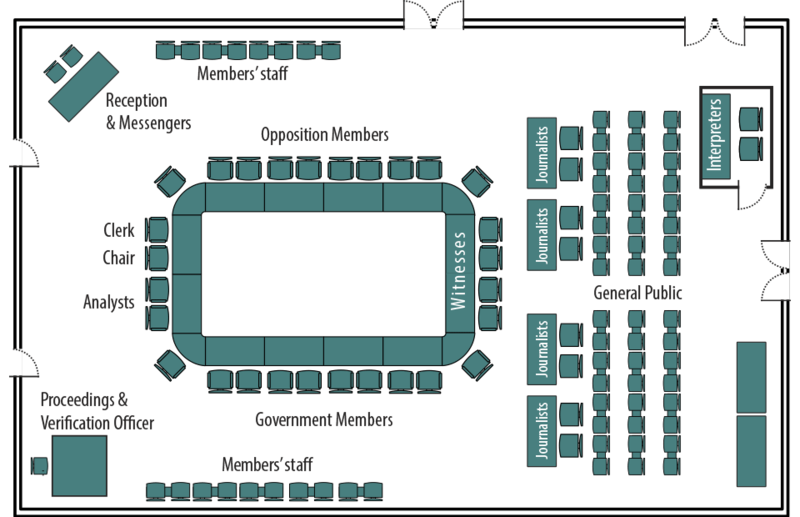 For instance, Transport Canada, or our transport minister, or the Minister of Natural Resources, appears before respective committees on their estimates as well, but this is all very helpful. You still have 15 seconds. Perhaps we can move on to Mr. Weir, for seven minutes. One of the concerns about public-private partnerships is that they tend to cost more because the government is effectively paying a private partner to borrow money at a higher rate than the government itself could access. I was pleased to hear that the new government was going to remove the requirement that projects receiving federal infrastructure funding necessarily be organized as P3s. However, I was concerned to see in the main estimates a massive increase of 22% year over year in funding for P3 Canada. I want to clarify where the government is at on this. Is it trying to relieve municipalities and provinces of this obligation to structure their projects as P3s, or is it in fact pushing them down that road? The previous government's policy on a P3 screen proved to be very challenging in working with other partners, including municipalities, to actually get projects approved. It proved very challenging to try to comply with the P3 screen. It delayed projects and it wasn't necessarily the best way from a governance perspective. Our decision to change the P3 screen does not reflect somehow an aversion to the role that public-private partnerships can play, used properly in the right way. For instance, we're doing a lot on infrastructure right now. There are countries out there, including Australia and the U.K., that use public-private partnerships a lot for developing their infrastructure and they work with pension funds. Pension funds have access to capital at very competitive rates too. With bond yields at historic lows and Canadian pension funds with extraordinary understanding and experience in funding infrastructure around the world, pension funds are active. So it's somewhere in-between. There are some folks on the right who would think you could privatize sidewalks, and some folks on the left who see no role whatsoever, for instance, for pension funds in participating in these projects. We are in-between. Where it makes sense to consider public-private partnerships we will, but the P3 screen wasn't necessarily the best way to move forward. I would agree that the right approach is to look at things on a case-by-case basis and see what makes sense and what's actually the best option, which is why I'm pleased that the government got rid of the screen. It just strikes me that inevitably projects funded by P3 Canada will have to be P3. So isn't greatly increasing that fund really forcing the same thing as the screen did? The P3 Canada fund has made more than $1.3 billion in investments in projects across the country. It has leveraged more than $800 million in savings. An organization, Partnerships BC, I think it's called, is engaged in helping facilitate P3 projects in British Columbia. There are different provincial projects. There's some work being done in Ontario. I know Ed Clark, a former CEO of TD Bank, is involved in some. There is a role for P3, Mr. Weir, but I think, as you said, it should be determined on a case-by-case basis, and P3 is part of that decision-making process. But there are some countries out there and some provinces that are doing some very innovative things around P3, getting good value for taxpayers, but building really important projects for citizens. Just to change gears, the main estimates also increase expenditures for the Senate to $90.1 million. That represents an increase of $1.4 million over the previous estimates. It seems that every time we look at the Senate, it's asking for another million dollars. The last time you appeared at this committee, Minister, I was asking about a million dollars a year for this new advisory board on Senate appointments. Just recently we had the government leader in the Senate asking for about one million dollars for his office to manage supposedly independent senators on behalf of the Liberal government. I would ask what's going to be achieved by the additional million dollars in these main estimates? In an overall sense, do you regard the more than $90 million that's being spent on the Senate now as a good use of money? Mr. Weir, the debate as to whether or not to have a Senate is not necessarily the subject of my appearance at this committee, but it's a great discussion that I'd love to have with you any time. The fact is that there's a constitutional reality in terms of provincial requirements if we were to do what I think you're suggesting. What we are doing as a government is levelling with Canadians and saying there are ways, without our opening up the Constitution, to make the Senate more effective, less partisan, and more constructive. Some of the questions you're asking may be directed to the Board of Internal Economy, as an example. If we're going to have a Senate, we have to fund it in the same way that your office gets funded, my office gets funded, parliamentarians' offices get funded. We're not going to have a Senate and not fund their operations. I'm meeting tonight with the Senate committee, the equivalent committee. I can tell you, Mr. Weir, that when I meet with senate committees, I meet with senators who are diligent and prepared and effective in the work they do. I would urge all of us to consider that there is important work that goes on in the other place, and to recognize that as long as we're going to have a Senate, there are things we can do in terms of governance to make it operate more effectively. I think that's what we're trying to do as a government. Mr. Weir, I'm sure you have another point, and the minister would like to engage with you, but unfortunately we're out of time. I'm sure he would, yes. We'll go to Mr. Whalen now for seven minutes, please. I will get straight back to the main estimates, I want to talk a little about the $400 million decrease that results from the elimination of the accumulated severance. I want to come at it from two different angles. One, what was the policy rationale and will this save the government money over time? I guess the second aspect of the question is, when we removed these severance payments, was there any analysis done to ensure that it didn't disproportionally disadvantage certain groups? Was the GBA-plus analysis done with respect to eliminating severance payouts? If so, what did it say about whether or not different groups—women or indigenous people, or lower paid employees, or people from diverse backgrounds—would be more or less disadvantaged by the elimination of these severance benefits? It's an important question because it represents a very significant figure. In fact, there's a $400-million reduction in paylist requirements—that's part of Treasury Board vote 30—which returns the vote to historic reference levels related to immediate settlements related to the elimination of accumulated severance, and this is nearly complete. This was, in part, a result of negotiations. These were parts of negotiations with the public sector on this. I'm going to ask Yaprak to intervene on this, but it is part of a negotiated process. We are striking and restoring a culture of respect for our public service, and we are negotiating with them on an ongoing basis now. This is a result of a previous negotiation that had occurred under the previous government, and I'll ask Yaprak to intervene. The policy rationale for this was that the federal government was one of the very rare employers that provided severance payments to those people who decided to quit or to retire. A normal understanding of severance is that if you're let go, there's a severance package that you are given. In the federal public service you accumulated for every year you worked, a certain amount of days, and it added up. After 35 years you would have so many weeks of severance pay even when you were retiring. At that time, the government proposed to unions, and this was negotiated with the core public service, to discontinue the accumulation. However, everybody who had accumulated severance had options either to leave it invested in the government, so they could take it out when they retired, or they were allowed to cash out whatever weeks they had. If you had already accumulated 20 weeks of severance, that was cashed out. This was a public service-wide initiative, and it didn't particularly affect any one group more than others. Maybe I'll follow up. If that practice is now being eliminated such that people won't be able to bank the severance, then that's a change in policy in terms of whether or not individual workers have that entitlement. Was GBA-plus analysis done by the government independent of the negotiation to determine whether or not that type of a policy decision would have a gender-differential effect? Were women more likely to accumulate more or less severance? What did the data-driven analysis say? I will get you the details. I don't know what was done. I wasn't in my job at that time. It would have been about six years ago. But, overall, the public service is 54% female, so in terms of whether it had an impact on women more than men, I'm sure that it must have been looked at. Given the fact that nothing was being taken away, the discontinuations happened from negotiated agreements going forward, so none of the existing entitlements were taken away. We will follow up with the committee. It's just one of those things. It's a government policy to have all policies evaluated on this criterion. Yet, sometimes when you look to see what the results of that evaluation were, or even the underlying data that led to the policy decision, it's very difficult to find the result of that GBA-plus analysis. We'd like to start seeing that if we could. We'll get back to you. Six years ago Yaprak wasn't there in her job, and I was sitting where Mr. Weir is sitting right now. Hon. Scott Brison: So we'll have to get back to you. In terms of oversight, when we look at the main estimates for 2016-17, just under $50 million has been set aside for decision-making support and oversight. This is table III, I guess, on page II–271. What type of oversight are we talking about here? Is this the type of oversight where we're saying, okay, we're paying a transfer out to a province, and this is making sure that the province is compliant? Is this money that's back-end decision-making support on the financing side? What type of oversight are we talking about? The mandate letter talks about finding out whether or not the budgetary expenses are meeting their objectives. Is this money that is dedicated toward determining whether or not objectives are being met? If not, are we likely to see in estimates (A), (B), or (C), or work that happens over the course of this mandate, a line item for money towards measuring statistically the outcomes associated with programming implementation? Treasury Board is very much in the wheelhouse of establishing metrics with departments and agencies and measuring milestones and results. This is something we can do better, and we want to do better, and we will do better, in working closely with departments. In government, typically we focus 90% of the effort on getting a policy right, and we assume that the results will just happen. The reality is that if you get the policy right, that may represent about 10% of success, but the 90% is actually execution. We know that at Treasury Board. These kinds of investments are designed to increase our capacity to deliver results, working with departments and agencies. We are committed, and our Prime Minister is very committed, to ensuring that all the investments made by government, and particularly new investments consistent with our mandate letters as ministers, will be honoured and that we will deliver results. Treasury Board is central to that. These are the kinds of investments required to actually do this sort of analysis and put in place the kind of results-focused milestones and structures to ensure results. We're now down to a five-minute round. We'll go to Monsieur Blaney. I would like to welcome the minister for his second appearance before the Standing Committee on Government Operations and Estimates. I would also mention, Mr. Chair, that we intend to support the requests pertaining to the main estimates. Mr. Minister, when you last appeared before the committee, you indicated that you were implementing a new pay system for federal public servants. You said at that time that everything was fine in the best of all worlds. You are now preparing to implement the second phase of the Phoenix pay system. We have learned that public servants are not receiving their pay, specifically Canadian Coast Guard employees, who return from several weeks or months on assignments abroad for Canada only to discover in horror that their pay has not been deposited. Can you reassure us that the errors that occurred during phase one have been corrected and will not recur in the second phase? One has to feel for federal public servants, especially those on lengthy assignments abroad who are without income for some time. Thank you very much, Mr. Blaney. I appreciate your question. Two years ago, the previous government started implementing this pay system. The federal government's pay system is over 40 years old, so it has to be replaced. The new Phoenix pay system will ensure that new laws, policies, and collective agreements are implemented within the required time periods and that employees receive their pay on time and without errors. When an integrated solution such as this new program is implemented, there are always problems, whether in government or in the private sector. It was the previous government that decided to create this program, and we agree that it is important. There are, however, problems at this time, and we are working with the departments and agencies to correct them. Perhaps Mr. Baltacioglu has something to add. We certainly agree on the implementation of the new system, but can you reassure us that for those who have been negatively impacted, the situation has been corrected? As the minister suggested, this is an enterprise-wide initiative. It is a complicated thing to get rid of a very old system and bring all of the public service to a new system. Before the next phase of departments are brought onboard to the new system, Public Services and Procurement Canada, which is the responsible department, is checking with every department and identifying the areas that we have problems with. We are feeding into them and alerting them if we are running into problems. If they feel we're not ready, they will delay. If they feel that 99% of it is going to work, then we will go forward. As implementation phases evolve, we're taking it as well as we can. Mr. Blaney, I'm informed that there are support measures, and there's emergency pay for those affected by these glitches. If you, as a member of Parliament, or if any of you hear anything, this is something that we want feedback on. I was working in that department at that time, Minister. Was I a pretty good fellow to work with at that time? Did we pay you on time? Hon. Scott Brison: The issue there, and I'm not being partisan, exists with every government and every major business when they're doing enterprise-wide solutions, and it is so frustrating. I still have some level of PTSD related to my last experience in enterprise-wide computer solutions, or IT solutions, and we still deal with it now. We want to become better as a procurer of enterprise-wide solutions. We have a ways to go, as do most governments, but there are other governments from which I think we can learn. This is an area of significant challenge, and I appreciate your raising it today, Mr. Blaney. In an attempt to alleviate your stress levels, Minister, we'll go over to the other side, to Monsieur Drouin. No, no. I enjoy hearing from Mr. Blaney. Hon. Steven Blaney: I was just on the verge of beginning. When we say it's a five-minute round, for questions and answers. I want to talk to the Minister. Thank you, as well as your department, for being here. I want to talk to you about something you touched on, and that's the main estimates and the alignment with the budget. I know that the budget in Australia will be coming in 13 days, 16 hours, 42 minutes, 46 seconds and counting, on Tuesday, May 3. They have this nice countdown here. It's great. You talked a lot about the Australia model. Are there other jurisdictions that the committee should be looking at, other than Australia, that have this similar type of main estimates and budget alignment? I cited Ontario as another jurisdiction that has pretty good alignment in this sense. Quebec, actually, in terms of alignment of budget and the estimates process, has a better situation than we do in Canada. The C.D. Howe Institute has done a study of this, which I would commend to you. Honestly, this is something we would really like to engage this committee on. I was at the World Economic Forum a couple of months ago, where I met with the Australian finance minister, the equivalent of the Treasury Board here. We discussed some of their issues. There's an opportunity to have bilateral discussions between you, as parliamentarians, and Australian parliamentarians, and ministers and parliamentary secretaries. I want our government and Parliament to be moving forward in unison on this, because we all have a vested interest. Ultimately, making the system more understandable and sensible, and aligning the system, will make it easier for parliamentarians to hold governments to account. It will also make it easier for Canadians to hold government and Parliament to account, which I think is a good outcome. I think ultimately it will result in better policy and results from government, as people can hold us to account. This is one part of a more results-focused Parliament and government. Our accountability to Canadians is going to be improved if we get this right, and I believe we can. Mr. Chair, the last time we had a field trip, we all had hard hats. Maybe it's an opportunity for us to look at Ontario, Quebec, or Australia, to see the types of models they have. I've had a brief conversation with the minister on this, and I concur. If I read the committee correctly, I think there's a desire and a willingness on the part of this committee to try to do an in-depth study on better alignment of both the budget and the estimates process. There is a mechanism in place for committees to travel. Should the committee desire, at any time, to make any kind of road trip, whether it be in Canada or outside of Canada, there is a mechanism through which we can apply for the necessary funds to do so and send at least certain members of the committee, if not the entire committee. Treasury Board has prepared a background paper to provide to the committee, which can help inform your deliberations as well. At Treasury Board, if we can be a resource to you, we would like to very much work closely with you on this. I think it's important work. Minister, thank you for the kind offer. I know we will be discussing, as a committee, future business. I think, if I read the committee right, there is a willingness to try to make sure we engage in a study on this. We'll certainly take you up on your offer, I'm sure, in due course. Mr. Drouin, you have about 45 seconds left if you have another quick comment. Just quickly, I know that previous committees have looked at the arguments for accrual accounting and cash accounting. I know this can be a never-ending debate. Probably Yasmin would have more to say about this. Is that something we should probably loop in, or would we be trying to do too much at this point? When the Australians reformed their system, it's one of the things they sought to address. They reversed some of their initial decisions to do that. Accrual and cash accounting can coexist in reportage. This would be something I would look at, and I would recommend that you look at it. If you're going to be talking about how to reform the system, you certainly should think of it. The Australian model indicates there are some unforeseen or unintended consequences of going with one. Now, Mr. Blaney for five minutes. Mr. Brison, at a previous meeting, you said you were our watchdog. Since then, there have been some rather worrisome signs. During the election campaign, you committed to modest deficits. The Minister of Finance has announced a deficit that is much higher than expected. The numbers are contradictory. Have you exaggerated your expenditures or underestimated your revenues? I asked you at our last meeting whether the plane had a pilot or the ship, a captain. Can you assure us that you are managing taxpayer money efficiently and that you will achieve your financial objectives? Mr. Blaney, our government inherited a deficit from the Conservatives and very low economic growth. During the election campaign, we presented an economic plan providing for significant investments in infrastructure, education, aboriginal communities, the middle class, job creation, and economic growth. We believe in our plan and our approach. Mr. Poloz, the Governor of the Bank of Canada, stated recently that our investments were important for stimulating economic growth. David Dodge and Kevin Lynch, two former deputy ministers of finance, and Larry Summers, former Secretary of the Treasury in the U.S., have all commented on this. It is an important debate. We have, nonetheless, clearly stated that we will continue making strategic investments to create jobs and help the middle class. We will indeed continue doing so. Of course, Mr. Minister, and to boost your credibility among taxpayers, it is certainly in your interest to take a fact-based approach. As you know, the finance department has clearly stated that you took office with a budget surplus of over $1 billion. Growth is now higher than expected. I would like to return to the expenditures that we are discussing today. You are asking us to approve supplementary estimates to welcome Syrian refugees. Could you provide a breakdown of these expenses? Will there be additional costs in welcoming the Syrian refugees? You seem to have adjusted your targets based on the number of refugees we will receive in Canada. You have about a minute and a half left, Minister. So we both agree it's a surplus, Minister. Look, any government can use rosy growth projections to create a notional or illusory surplus. We're levelling with Canadians on this, but that's a discussion for when I see you in the gym sometime. We are very pleased as a government, and I think all of Parliament shares our enthusiasm, for the success of the Syrian refugee initiative. This was accomplished at a cost of just over $700 million, which was actually under budget. We have not utilized the additional reserves, the contingencies established for the purpose. In addition to the commitment made in budget 2016, the government has confirmed a new approach to the ongoing crisis in Iraq and Syria and its impact on the region. This is fundamental to the future of Canada in terms of our ability to attract new Canadians. A lot of people say this is a great thing to do for Syrian refugees. I think it's actually a great thing to do for Canada. These Syrian refugees, in 20 or 30 years, are going to make a huge difference. I serve on the ad hoc cabinet committee for Syrian refugees, as does Minister Monsef. She was an Afghan refugee and came here as a child. To have a former Afghan refugee sitting as a cabinet minister today makes me wonder sometimes whether, in 20 or 30 years, we might see some of these Syrian refugees sitting in the House of Commons or as members of a cabinet. I think it's an investment in the future that we all welcome. I believe we have time for one final intervention. Mr. Ayoub, for five minutes. Thank you, Mr. Chair. I did not expect to have the chance to ask questions. Mr. Minister, we can see that the lion's share of expenditures in the budget are earmarked for seniors and health. For seniors, there is an 18% increase, primarily owing to old age security and the guaranteed income supplement. Are there any relevant statistics for the last five years? What are the projections for the future? The budget is, of course, tabled every year, but I expect there are demographic forecasts. The increase includes OAS and GIS. It's expected to be $48.4 billion in 2016-17, and that is an increase of $2.3 billion over the previous amount. This is important to realize as well when we're talking about the main estimates and then we introduce a budget. Our budget made significant investments, for instance, in increasing the GIS for low-income seniors. A single senior on GIS will receive an additional $1,000 per year. This will have fiscal implications as well, and important ones, and it's an important investment. Again, that is a discussion. I would like to have the budget and estimates process more closely aligned so that we could be speaking of the two in unison, because we're speaking in some cases of increases or decreases as a result of things that happened under the previous government or that don't have anything to do with what we're actually doing as a government. The Syrian refugee question is something that in terms of estimates does relate to decisions we made as a government, or largely, in part, but a lot of these other questions relate to decisions made by the previous government. It's an important question. It's critically important to invest, particularly in our vulnerable seniors, and we will continue to do so. You have two minutes left. The other question would be about Statistics Canada. There's an increase...with 35,000 employees. Returning to Statistics Canada, I want to talk about something that has not been done for a very long time. It would be interesting to see what share of the budget—$126 million is a significant increase, after all—is earmarked for the training of 35,000 new employees who will help develop the new census for Statistics Canada. I don't have an answer to that question, in terms the percentage of that to be used for training, but my colleagues and I will endeavour to find out. That's one thing. When you've been around here long enough, you actually are able to say, “I don't know the answer to that.” But we will get back to you, okay? It's an important question. You'll be pleased to come back—no problem. A voice: Yes, I think he did. Hon. Scott Brison: But we will get back to you on that specific question. Thank you. Mr. Ramez Ayoub: Thank you. Thank you very much, Mr. Minister, once again. Thanks to you and your officials for your attendance. It's very much appreciated. We'll conclude the meeting now. You are excused. Mr. Chair, I want to thank you and all the committee members, first of all, for your flexibility and, second, for your input. To any of the questions, we'll provide the answers. I want to come back and have a longer discussion sometime on this budget/estimates process with some ways the committee could really help, as we move forward on this. I think it's really important work, and we value the work of your committee very much. Thank you very much. That's excellent. Thank you again.